The question of how to style handknits can be a tricky one. Any knitwear stylist might wax lyrical on the question of just how difficult hands can be (if one doesn’t have a nice mug in the props basket you know those mitts won’t look their best!). In general, I really enjoy thinking about styling my designs (it is after all a kind of dressing up). 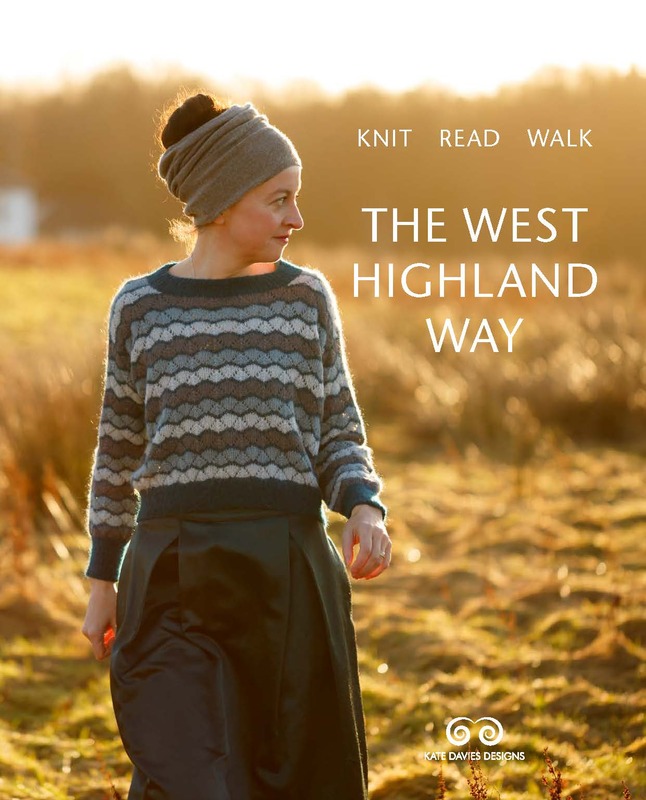 But there are few designs I’ve thought more about how to style than this week’s pattern for my West Highland Way club – the Shieling Blanket. This blanket is a fairisle showpiece. I loved working on it, and was (though I say so myself) totally blown away by the finished object. It’s a modular pattern, intended to celebrate the familiar thistle motif that appears on West Highland Way signs and waymarkers. One square is simple to whip up (just like knitting the crown of a hat) but when 30 squares are joined together the effect is pretty spectacular. When the finished blanket was constructed I saw how the thistly colours I’d chosen shimmered together like some gigantic Arts and Crafts tapestry . . .did I really design this thing? COR! I had designed it, but how on earth were we going to photograph it? The blanket is large enough to cover a small double bed like ours, but I felt a bit weird about styling something in my own bedroom. And though I personally really like the interior of my own house, I feared that dog hair and general shabbiness might intrude on images whose only purpose should be to celebrate this amazing blanket. I also felt strongly that outdoor photography is a sort of signature of what we do – and perhaps particularly of our current project. The West Highland Way is about the great Scottish outdoors: surely the blanket should be photographed in an outdoor setting? But HOW? I faced a similar conundrum when photographing the Birlinn blanket from our Inspired by Islay collection. There, I came up with the grand idea of taking a basket to the beach, placing the blanket on the sand, and setting up a sort of picnic, complete with tea pot and tunnocks tea cakes. This was, in itself not a bad notion . . . until I remembered just how bloody windy a Hebridean beach can be. In these images, velocity had reached about force 8 and, when not wrapped about my wind-whipped person for necessary warmth, the blanket was in danger of transforming itself into an impromptu sand yacht and setting off with me to Ireland. There was no question of opening up the basket and playing at tea parties. Tom shouted instructions uselessly at me into the gale, I used my arse to anchor the blanket to the ground, I sat still and held on gamely. 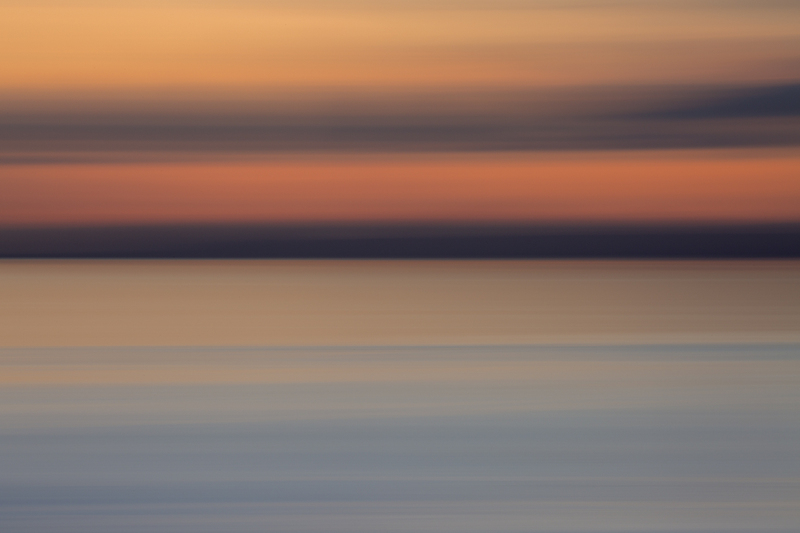 I kind of like these images – the colours and light are pleasing – but when I look at them I remember that there was no one else about on the beach that day for a reason. The Shieling is a much bigger blanket than Birlinn. There was no way I was going to be able to hold it out from each corner, and it looked a little odd just wrapped about me. What we needed was some sort of sofa, and some sort of outdoor setting. I mused for a while on the potential of our garden shed, but a backdrop of a few meagre winter cabbages was not what I really had in mind. Time was moving on. We had to photograph the blanket. Then I came across some garden furniture dramatically reduced in the January sale. That sofa thing was really very cheap! I did not need an outdoor chaise longue but perhaps the blanket did. Tom wasn’t sure about my plan and even less so when it came to the time to share our living room with an outdoor chaise longue. This thing was much bigger and heavier than I’d realised. Were we even going to be able to carry it? Meanwhile, the weather was like it generally is in early January: grey, windy, lots of snow. And still, we’d not photographed the blanket. There was more than a foot of snow on the ground as we walked the chaise along the road, over the hill, and down toward the lochside. Three trips on foot were involved: one for the base, another for the sofa cushions, and a third for Tom’s camera, tripod, reflectors, and, of course, the blanket. All right, then! Let’s get this shoot on the road! Yes, I am lounging casually in sub zero temperatures on a chaise longue by a loch . . . what of it? The blanket really IS cosy though! “Yes, that’s great. I’m making a sunstar. After about an hour’s photography we faced the return journeys, with the sofa cushions and equipment. Finally we began to hoik the chaise back up the hill on our backs. In the distance, snaking along the road, we spotted around thirty people from a local walking group. It was certainly a grand morning to get out for a walk, and the two figures struggling with the sofa made an unusual sight in the snow beside the loch. The whole group paused and gathered to watch our labours as slowly, hesitantly, we lugged the sofa up the hill towards them. “What’s all this then?” asked one, making a witty remark about witnessing a burglary. This is soooo hilarious!! Thank you for making me laugh! Thank you for the lovely photos and great great blogpost! The things some people will do for their art . . . It looks a truly amazing blanket though. This story is hilarious! But we can fully understand your whole styling process now! If it’s not dedication, i don’t know what is! The picture are really beautiful! A bit over the top, but that’s what making it really funny! And, maybe the photoshoot needed to match your pride regarding the result of your design! Regret nothing, this blanket is GLORIOUS! This is one stunning piece and your story made me laugh!!! I know what you mean – love knitwear photography and probably take it way too seriously :) One time me and my friend were stopped by the authorities when shooting in front of the beautiful door, trespassing (just a little bit haha) the private territory. It took a long time to explain the meaning of the perfect background for knitwear photos. Loved reading this post – the background, the dialogue, and the photos :) It’s such a truly beautiful blanket!! Oh my, you and Tom are simply adorable. Beautiful work, both of you! Lol, brilliant all for cause of knitting.😁 . I have to say the blanket is beautifully designed with those thistle patterns. Will look forward making it soon into a cushion when I finish my other present projects. I was with you all the way! What a great story. And even your beautiful Carbeth didn’t look like it kept you warm enough. I so look forward to your posts. But I sincerely hope that your reluctance to shoot in your home isn’t still a bit of a reaction to the comments about your modelling! I am almost finished a Carbeth for my daughter. Hahahaha! Brilliant write-up Kate. Laughing my socks off at the image of you lugging the sofa up the hill whilst the walkers watched askance! So funny!! I laughed out loud several different times reading this. Thanks for the behind-the-scenes peek at all the “bit much” aspects of styling knit blankets. All your efforts are so worth it! So lovely. This made me laugh out loud– and I think “For Knitting” may be my new life motto, or better yet: as a new family crest (the existing one is rather boring with keys and crowns and the like– knitting needles seem much more interesting). The blanket is absolutely stunning, and I’m grateful for your willingness to schlep lawn furniture through the snow so we can have lovely things to look at. Lying in bed of a Sunday morn, catching up on your e-mails (as you do!) and trying to recover from bilateral mastoiditis – this is the best laugh I’ve had for weeks!! Well that had me giggling. Great story, great photos, great location. Oh this is such an awesome tale, love it! Thanks for sharing with us Kate. Just stunning Kate and Tom! Love the design. whatever it takes for knitting! and I thought it was only me, who gets seen by strangers doing very odd things – all for my knitting:) I suppose after carrying everything down to the loch and back again – you’ve been nice and warm even without the truly gorgeous blanket:) you should have put Bruce in the pix as well – he’d have fitted in nicely colourwise! I laughed til I cried. And it’s a lovely blanket. I’d love to make it but first I’ll have to get a chaise longue. And a loch. Well done! All of it. So funny. Started my day off with a great smile. The blanket is absolutely gorgeous as well as the photography. Thanks to both of you. Stunning blanket, stunningly peaceful location (in spite of wind)! Perfect foil to the design. But where was Bruce?! The photos are fabulous and the blanket perhaps more so. You’ve inspired me to make it ASAP!!! 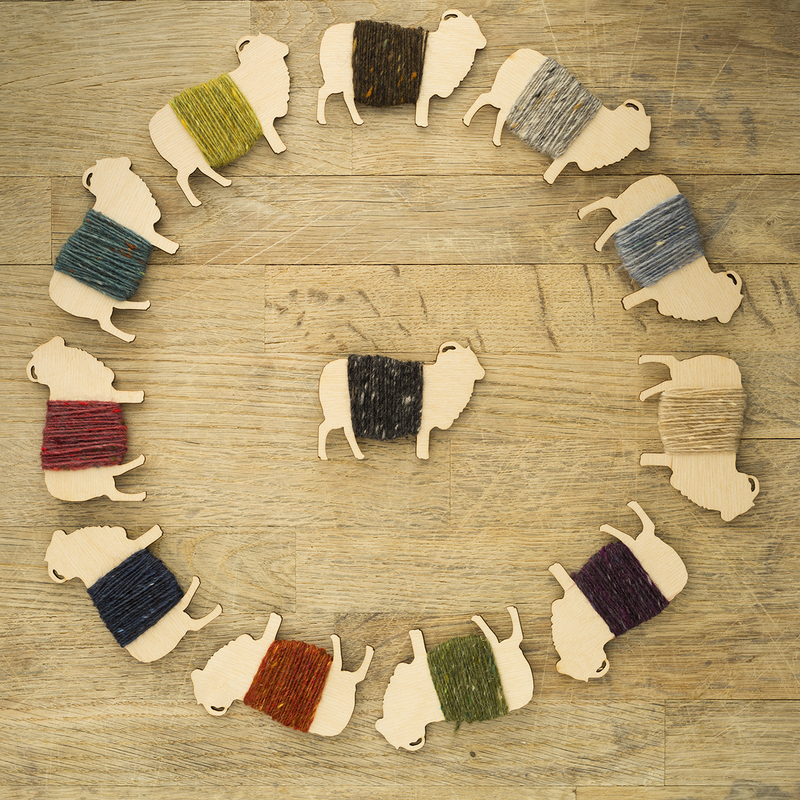 I can’t wait for the yarn to arrive, and hope that Garth gets back in stock soon! Absolutely gorgeous, Kate! Thank you for thinking of such an excellent backdrop for a truly lovely pattern. An absolutely stunning blanket Kate…What is the overall size please. This will definitely be on my to do list, will it be available as a kit at some time? I sincerely hope so. OK, This one did it. I had to join the club! Rarely do I see more than one or two designs in a collection that I wish to knit. I want to knit all of these so far. They fill my heart with such joy and the blogs and photos just make them that much more special. Thank you for sharing your talent with us. I feel privileged to have the opportunity to make such beautiful items from your designs! I love it! And I too have done some silly things in order to get nice picks of my knitting! Your pictures and styling are wonderful! LOVE IT — totally fabulous – you are absolutely AWESOME! Thank you! LOL is right. That was fabulous and all that was missing was a wee dram in you hand………for the convalescence by the loch! The Thistle IS my favourite flower and I am so glad you are honoring it in this way. Still laughing..
What a wonderful post, and now I’ve 2 blankets in the queue!!! I enjoyed everything about this post….. the pictures, the commentary, the stamina that you and Tom have, the determination, but especially the thought of you and the blanket flying over to Ireland!! What a hoot!! Thanks a million for all this!! Wow! That blanket is absolutely gorgeous!!! I guess Kate, that apart from the amazing knitting, the excellent photography and the to die for setting, my thoughts were to congratulate you & Tom on the fact that, despite you being post stroke, you both continue to have amazing drive and energy to go lugging things like the chaise around! Not your average post stroke activity but one that should be applauded and lauded. I do agree with a previous comment that the WHW club really is your best yet with some stunning pieces of work. I eagerly anticipate the posts each week. Thank you so much for your hard work and diligence, that clearly stretches to the right props in the right setting. Well done. It’s been a long day. My 98 year old mother-in-law is home after an operation for a broken hip, the livestock has been attended to, my dog is at my feet and there’s a wee dram in my hand. Your post is the icing on the cake. You and Tom are intrepid ! Your teamwork and passion for your art (knitting and photography) always surprise and delight, whatever you are doing. These photographs are stunning, as is the blanket…what an inspiration ! I love this post. AND I love all the shots. This is one of your wittiest posts! All for the sake of ‘art’ or rather ‘knitting’ hauling lawn furniture through the snow. You married a good one, to be out there with you dragging the lounge through the snow. Great story–(ANYTHING for Art!) — wonderful photos, and GLORIOUS blanket! ( My Scottish family side begs me to try it, but my practical side says I’d never be able to do it.) But I will forever admire it, and envy your talent..and determination! This blanket is totally awe inspiring! I’ve only ever partially made one stranded knitting project, messed up the pattern, put it to one side, then couldn’t find my place again. We need two couch blankets for our home and this pattern is a must for one of them, will keep to the same colors too as they are gorgeous. Working on a 24 row hanging diamond pattern in two colors right now for the other. I also totally enjoyed the reading of your photo shoot(s). I lived in south Hampshire for the first 16 years of my life and now live in the Pacific NW USA so can totally relate to windy beaches although the climates are much warmer than Scotland. Your commentary was so descriptive I could really “see” you and Tom trekking back and forth through crunchy snow and probably sweating under that beautiful sunlight. Thank you for a great start to what appears to continue as our typical drizzly NW late winter weather. You have given me some sunshine to remember! It is a rare thing to have beauty and humor juxtaposed so precisely and exquisitely. I am in the WHW club and have already decided to knit Shieling, but this post puts a big exclamation point on my decision. I plan to knit it outside during our lovely Port Townsend, WA summer. Great job! Most people don’t know how complicated photo shoots are to get those great shots. The blanket is beautiful! The sun star is pretty cool too! Wonderful results for all your dedicated work. I’m speechless. What a great morning read. And the blanket – wow! Hilarious story! I love it. I can totally picture a group of walkers all huddled together as they watch a couple heave a couch up a hill. Amazing. The blanket really does look good though! And the sunstar out of your eye is pretty cool too. :) Worth the effort! Oh dear… crying over here in the States. I’m going to chortle about this all day! Lovely blanket. The photos are great, and I love the “Victorian convalescent by a frozen lochside!” The Cialis (erectile disfunction drug) commercials we’ve gotten in North America, featuring two clawfoot tubs perched on a cliffside (not sure how the Cialis is working there, but still) come to mind when thinking about “unusual” set pieces. Oh how funny, yes that is one of the silliest commercials I have seen….Kate and Tom’s photoshoot leaves that one in the dust ! Lol lovely story, lovely blanket!!! This is impressive! I feel like I might not be making enough effort when I chuck my (sometimes) blocked finished items on the floor and hope there’s enough daylight to adequately photograph them with my phone! I’m pretty much lost for words about this stunning blanket – but glad you know and appreciate you’ve created a sensation. And the story is hilarious!! The blanket is stunning– possibly what I’ve been waiting for to really take the plunge into stranded knitting (I did some Christmas stockings with a single band of 2-color knitting…not really a fairisle project!) Surely all that work was worth it to showcase something that gorgeous, though! Oh my goodness, Kate! This blanket is spectacular and why else would one be out by a frozen lake, in a foot of snow, other than for a knitting photo shoot? Such a wonderful read and beautiful photography. Well done! Thanks for the giggle, Kate! I love reading your blog, because my childhood was spent at Balmaha, and much of what you, and Tom photograph is familiar, even nearly 62 years later! I have just got home from a funeral, one of the best I have ever been to, but still the funeral of someone who died too young. This post has helped enormously. Thank you, both, for your knitting, your writing, your photography and for sharing the beautiful part of the world you live in. Oh thanks so much for this, I was crying with laughter. I had wondered about how you got the sofa down to the water, and was looking at the footprints in the snow and guessing it was a bit of a struggle. It is a beautiful blanket! What on earth will you do with “the sofa thing” now? Oh, this did make me laugh. I shall show it to my partner the next time he grumbles about having to take a photo of me in my knitwear for my ravelry pages. Am absolutely LOVING this club – your best one yet! Oh…..such a lovely, well told and beautifully photographed story, and the blanket is stunning!! I think I’m going to have to make it. I saw these pics first on Instagram and I’ve been waiting–impatiently–to see the final shoot. So glorious, and a wonderful story to go with it. The blanket is genuinely magnificent, and is going into my queue–promises to knit down my stash be damned! I always enjoy your blog, but I don’t usually laugh out loud. Thank you for a good start to my day! And the blanket is beautiful. “lounging casually in sub zero temperatures on a chaise longue by a loch” – of course, that’s why you need this FANTASTIC blanket, no? I wonder, where’s the point :o) What a story. Made my day. I have just received some extremely bad news about a friend and this post has made me smile, when I thought I might not smile again for a very long time. So thank-you, for the beautiful blanket, the words that transported me back home to Scotland, the stunning photography that almost makes me wish I still lived there and for your perfect timing. Everything about this is charming, and the blanket is a work of art. I like the idea of styling my finished objects. They deserve it after all my hard work. Or, for that matter, for sleeping. You just enjoy the brisk night air! I thoroughly enjoyed the tale – sounds like something crazy I’d do for a photo shoot – but I also thought that the photographs highlighted the blanket in ways I had not seen it. … Of course, now I must knit my own…. Brilliant – the Blog, the Blanket, the Photos and of course, you, Tom and Bruce. Thank you so much. Gorgeous photos and the blanket is spectacular! I love it! Well done and a great idea on the garden furniture. A great story, love the chaise, want one now. The blanket is breathtaking! Made me smile, and then laugh. But I’m in total awe of the design, the workmanship, the inspiration and the photography. Made my day. It’s a stunning blanket, Kate! So worthy of the effort. So funny, and enlightening. With others, I do hope the walking group helped out. It’s breathtaking. For once in my knitting life it makes me itch to do colourwork – single-square cushion kits, perhaps? Love this post. A good story is what I’m after and this one really made me smile. And of course the blanket is stunning. Too, too funny! Great writing, great knitting, great photography. You and Tom have done it all beautifully. I hope I can manage enough squares for at least a small blanket. I agree–one of your best posts. Great way to start the morning. I could just see the lugging of the props, feel the cold, imagine the walkers’ reactions! The blanket was worth every bit of it. You are an extremely talented writer, designer and knitter. I read your every blog. The photographer is pretty amazing, also! Thank you for sharing it all with us. 30 members of a walking group. Why is it never Patrick Grant? LOL!!!! Oh dear…that was great – thank you!! Your blanket IS STUNNING!! If I were you I would be jumping all around like a crazy monkey whooping and hollering due to creative genius ;) Really a masterpiece :D!! I wondered how you brought the sofa to the loch. Up here in northern Michigan, you could have put the sofa ON the loch. I hope the hikers helped you get the sofa back home – after they finished laughing. It’s he least they could do for the entertainment. I love the pictures and the blanket. Have to say that Tom is a saint! I cannot tell you how much your story made my day! The things we do to get the pretty pictures are kind of ridiculous – but you get points for going above and beyond with this one. Also, I’m LOVING Carbeth! Am knitting it up in local farm yarn from the Rhinebeck festival a few years back and it’s become my soothing knit after the news each night. You are keeping me sane, then. Sunstars and arse anchors. I loved this blog post. Also, the blanket is beautiful. Well done! Hilarious. Thanks for making me laugh and laugh this morning. I am sending a bunch of my non-knitting friends a link to this post and now they are going to be even more convinced than ever that knitters are nuts. And the pictures–AND the blanket–are beautiful! As usual. and you have had a great idea to go outside for photos…you look like in a sled russian! Hillllaaaariousssss! And stunning. All at the same time. Another masterpiece. This is truly one of the best blogposts. Ever. By anyone. Oh Kate, that blanket is a masterpiece, you must be very proud. But even more than that your description of the photo shoot had me ‘in stitches’! Thank you (and Tom). Oh, I so enjoyed reading this! Like some others have said I was so overwhelmed by the beauty of the blanket when the pattern arrived on Wednesday that I didn’t really think about the sofa by the loch, but if course on a subliminal level it had added to the pleasure of that first impression. Great to read the back story to Birlinn, too! I applaud your determination in realising your vision. I also love your marled Carbeth! As usual, quirky, funny and a bit mad – but stunning and wonderful – blanket and photographs. What a pair you are and what a joy that you share all this with us. I love both blankets and the stupendous scenery. The locations are always sensational, whether a jersey, a cardigan or just the beautiful tree – I might be busy but there is always time to “read more” of your postings. And the marled Carbeth is rather nice, too! I was so focussed on the amazing blanket, the beautiful design, the desire to make one that I did not notice the sofa or the snow just the gorgeous blanket. Loved the story about the ‘Birlinn’ – a good laugh to start the day. The blanket is stunning. Love it when a design turns out so much more special than the original idea. I’ve always loved the styling of your photos (and this isn’t something I’m generally interested in) so i enjoy any posts you have about how you do it and the decisions you make. When i saw the photos initially i laughed to myself about having the sofa by the lake… but i hadn’t realised you’d had to carry it so far. it was well worth it, the pictures make the blanket look fabulous (though i think knitting one square will be my limit!). The deep snow really lets the blanket stand out. Grass and leaves and mud would have competed with the pattern. Great pictures, brilliant tale. You certainly struggled for your art. Cheered my fibro foggy head up to read this. It is definitely a story for the books but the photos prove the inspiration was spot on. Excellent description of the trials and tribulations of achieving the perfect photoshoot. The photos are simply stunning and the blanket is one of the most beautiful pieces of knitting I have ever seen. This is just hilarious! Thank you, your post made my day today. Lots of love from the Czech Republic!! It is a very striking pattern. I would be ever so interested to know ho long it took to knit, compared to say, your average yoke jumper. I have never contemplated knitting an item of such scale, but I am already thinking of a dark grey/ naturals version of this… Do you think monochromatic shade would look good, style queen? Wonderful photos, styling and story. Definitely one of your best designs ever, so impressive, and I think it may just have tipped the balance for my joining the Club… and I don’t know about knitwear styling, but the way you styled this blogpost was tantalizing. When on earth to you find the time to knit items like this with all your other activities? The blanket is absolutely stunning, the styling is perfect and so is the photography. Great post thank you Kate and Tom! This is simultaneously so funny and so breathtakingly beautiful! I love the juxtaposition of the exquisite photos of the wonderful scenery and knitting, and the funny stories. (Together, two of my very favorites). I greatly enjoyed this glimpse behind the scenes. Thank you! Wow! That is so beautiful! It would have looked stunning anywhere but it was well worth the huge effort you and Tom made. Fantastic photos, the chill, the sun, the snow and warmth of THAT blanket… a great bit of storytelling delicious breakfast read. Thanks! Well worth the effort as the photos and the blanket are awesome! i really like this story. this make me smile, it illustrates you being young and enthousiastic. i agree with tom, all of these pictures are a bit too much. but it is what we need in live once in while a bit of too much. Thank you for sharing the journey of your photo shoot. The Sheiling Blanket is quite beautiful and the photos as well. What a trek for you both with outstanding results. WOW. I am in awe. What a great read that was! Such humour! I was giggling all the way through. An absolutely beautiful blanket which I will make one day. I nearly snorted my coffee reading this! My other half had a rather rude awakening when we first met, that yes, going out with me did indeed include being expected to take photography and knitwear props out into the countryside in all weathers. It’s par for the course now, but I suppose it is a little bit niche, isn’t it?! And we’ve definitely never even considered dragging a bloody chaise out in foot deep snow. 😂😂 Totally worth the effort though – it looks amazing!